Digital Creation Critical ANalysis. Fractal. Last revised 9/22/2014. Return to Major concepts. See fragmentation. < Un baroque fractal (by Severo Sarduy) and L'activité fractaliste, by Klaus Ottmann, a set of six pages in Art Press Feb 1990. Presenting notabmu Carloz Ginzburg. They include black and white pictures of works by Ginzburg, Hautem, Hodgkin and Laramée. Today, Fractal art can be divided into two categories. The first group is mainly constituted by scientists such as Heinz-Otto Peitgen and Peter H. Richter in Germany, Clifford A. Pickover in the USA and the Asterisco Ponto Asterisco in Brazil (constituted by an architect, two scientists, a musician, two engineers an one mathemaician, whose work is present in a special secion of the 20th International Sao Paula biennal). This group of non-artists insists on beauty and formal creation, categories that have been forlors for long in contemporary ar. They underscore the democratic potential, or computer art. - Elien Carey (photo), (* not digital). Contrasting with the first group, these artists is frequently inspired by fractal and chaos theory, but does not limit itself to their limit..
- Concept created by Julia (1930's) and expanded (1970's) by Benoît Mandelbrot [Mandelbrot]. - Artists in the fractal domain: Xavier Gouchet (some works), Scott Draves!, Vaclav Pajkt. - Fractal art: art where digital images, with irregulaf forms are dominant, using fractal geometry. See Groupes, mouvements, tendances de l'art contemporain depuis 1945, by Mathilde Ferrer (ed.). Ecole nationale supérieure des Beaux-Arts, 1st edition 1989. New edition, augmented, 2001. - For a first visit, code source included, Generative art. A practical guide using processing. Manning Publications 2011. - Website on fractals and their beauty (indicated Alain Bittler). - Fractal characterization [Bres] p. 110-113. - [Gonzalez] . [Ebert] many pages (more than one page of poiners in the index), [Berger-Lioret] p. 151, 174-175. < L’arbre de vie a-t-il une structure fractale , by Jean Chaline, Laurent Nottale and Pierre Grou, in Comptes-rendus de l’Académie des sciences, 15 juin 1999. Cité par Le Monde du 3/9/1999. < ArtiE-Fract, used by Anabela Costa, visual artist. by Evelyne Lutton and Anabela Costa. Communication at Computational Aestheticss in Grahics, Visualization and Imaging (2012). D. Cunningham é D. House (Editors). - In october 1977, several artists and intellectuals signed the "fractalist manifesto" (published in Art Press magazine (n°229) in November 1997). 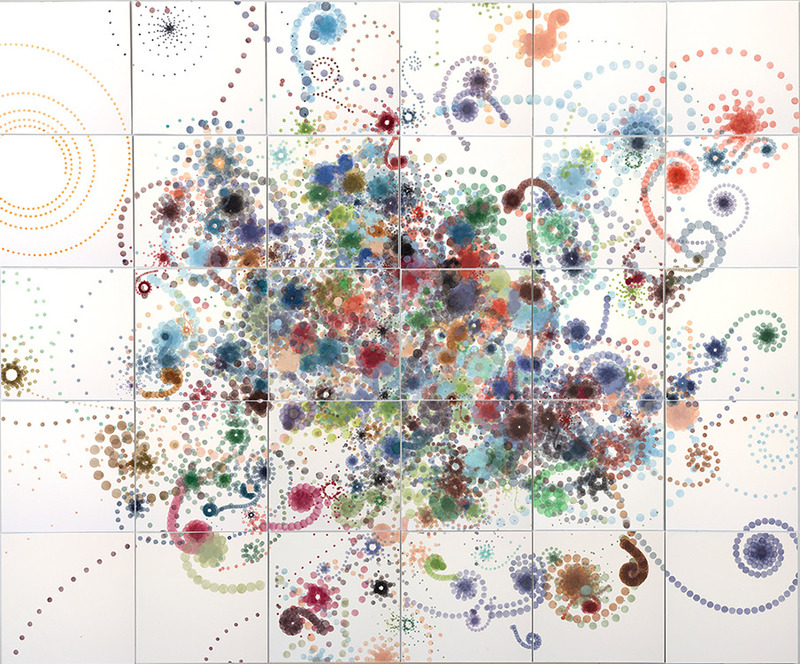 It is based on "the paradigm of fractal chaotic complexity". - Créanum de nov./dec. 2010, a set of articles,12 pages. - Example (with source code), by Xavier Gouchet , featuring a Buddhabrot. < Art fractaliste. La complexité du regard. by Jean-Claude Chirollet. L'Harmattan 2005.